Yesterday was Friday the 13th, but nothing bad happened around our house. In fact, I had a lot of fun last night. My friend Charlie and I represented the Lone Star Circus School, and Russ, Alan and Scott represented the Circus Freaks, and we had a lot of fun performing at the Cancer Support Network’s Friday night Kids Night out. The Circus Freaks are really cool — I’ve seen them on Tuesday and Thursday night when they rehearse and share circus skills at Valley View Mall, and at Spin Fest, but this is the first time I’ve ever actually seen one of their shows. I hope I get to work with them again — it was fun! 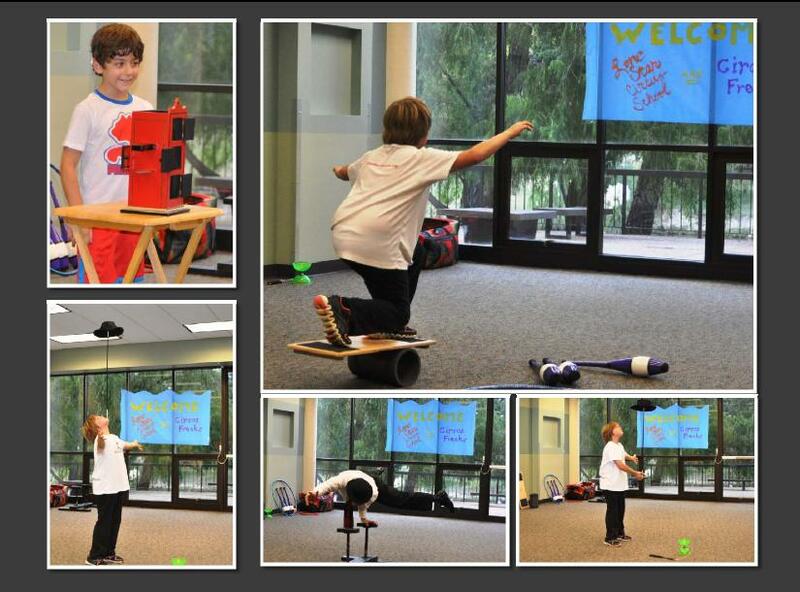 Charlie is in my advanced circus class at Lone Star, and he’s also a magician. He’s just 7, but he’s very smart, and he’s a really good magician. I did two short acts: a diabolo routine to Michael Jackson’s Dangerous and a mixed juggling and rola-bola act to Mannheim Steamroller’s Master in the Hall. You can see a video of me doing the diablo routine last spring in a school talent show here, and the rola-bola act here. I had to modify both of them a little for the show last night because the ceiling was too low — and I added a couple of new tricks that I didn’t know last spring. I think my grandpa shot some video last night. If he did, I will post it later. Here are some photos from last night. The people at the Cancer Support Network were really nice. They made a banner welcoming us, had snacks and drinks put out for us when we arrived, and gave us each a very nice thank-you card at the end. 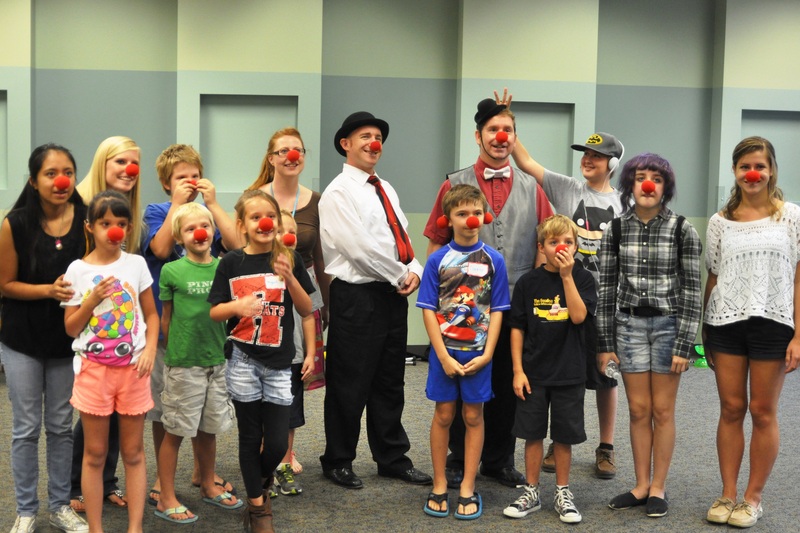 Allan and Scott (the tall clowns in the center) made the audience “graduate clowns” with their own red noses at the end of the show. Russ was taking photos, so he’s not in the photo. This is me warming up by the welcome sign the Cancer Support Network put up for us. What nice people! 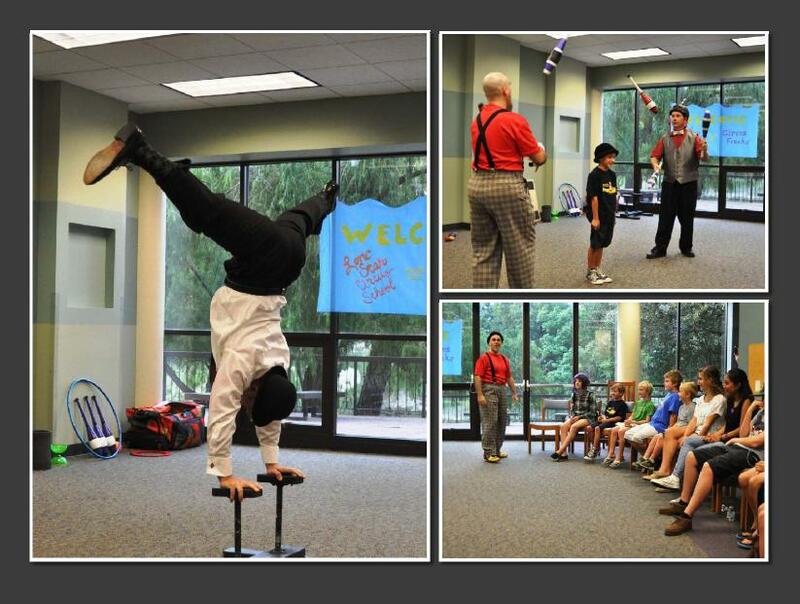 Clockwise from upper left: 7-year-old magician Charlie, me with one of my newer tricks — substituted into a routine because of a low ceiling, me balancing a spinning hat on one finger, Scott hand-balancing, me balancing a spinning hat on my chin. Clockwise from left: Scott was hilarious giving the legal disclaimer to being in the circus while dressed as a lawyer — and hand balancing, doing mime, standing on his head, etc. Right side, top: Russ and Alan passed clubs around a volunteer from the audience who was standing VERY still. Lower right: Russ works the crowd. He’s hilarious, and he saved me when I dropped my diabolo, popping into the act to toss it back to me. A great clown & juggler!